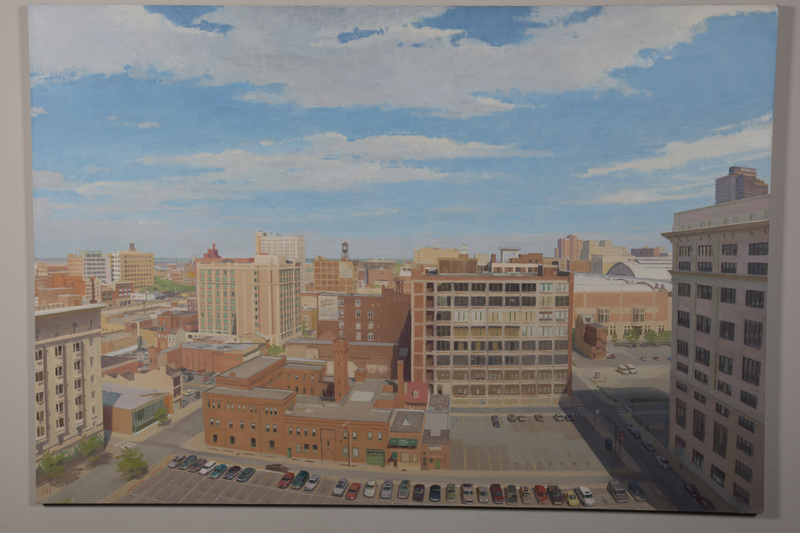 Awaiting the Convention Center, and its companion painting the Pennsylvania Convention Center also acquired – Expanding the Convention Center – were both painted from window views in the Hamilton Building on the west side of Broad Street opposite the Broad Street Atrium entrance to the Convention Center. The earlier picture, Awaiting the Convention Center, shows the array of buildings surrounding Cherry Street between Race and Arch, 13th and Broad that were demolished a few years later to make way for the Convention Center Expansion. Each of these buildings, the Firehouse and the Gilbert Building, Buck’s Hardware and the Naval Recruiting Station were part of the visual texture of an older Philadelphia. Illuminated by the orange-pink light of a late summer afternoon, they suggest a grand urban still life.